Evergreens are so important to the development of a great garden that you could say that a garden is incomplete without them. They are important in every season. In winter, when they are especially noticeable, they provide color, structure and definition to the garden and shelter for birds. In spring, the fresh green leaves and needles mingle with the emerging deciduous foliage to form a delightful tapestry in many shades of green. In summer, they help provide shade, privacy for outdoor activities and interesting textures. In the autumn, the contrast with the bright colors of changing deciduous leaves is striking. These plants, with their varied sizes, shapes, colors and textures, are infinitely useful. They can be planted densely for screens or windbreaks. Carefully chosen and sited cultivars make spectacular specimens. They can even be iconic when carefully chosen and sited. 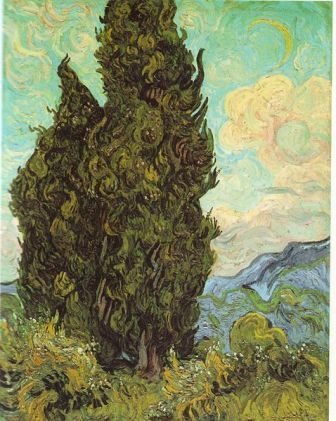 Think of the dark green cypresses silhouetted against the sky in the painting above by van Gogh. They can be sheared or left natural for formal or informal hedges to define property lines or to create special garden rooms. Mixing them among other plants in perennial or shrub borders creates four-season interest and variety. Of course, they are perfect for special uses such as topiaries, bonsai, and parterres. They provide material for indoor arrangements and holiday decorations. The broad-leaved types also include some of the most magnificent flowering plants in nature—camellias, magnolias and rhododendrons to name a few. And by the way, what exactly is the difference between a tree and a shrub? One of the main differences is that a tree is a woody plant that has a single trunk from which multiple branches extend. A shrub is a woody plant that has multiple stems arising from the ground. Now we all know that there are exceptions to this general guideline. Some trees can have multiple trunks, and some shrubs are pruned to grow from a single trunk. The other main difference in size. Shrubs are generally said to be under 10-13’ tall (not all experts agree on this rule), while trees reach a mature height of 13’ or more. And a ground cover is usually defined as having a mature height of less than 10”. So, some low-growing shrubs are considered ground covers. Whatever you call them, the important thing is how they are used in the landscape. The glorious garden always includes carefully selected and sited evergreens. These lists, including ground covers, broad-leafed evergreen shrubs, narrow-leafed evergreen shrubs, trees and vines, are by no means exhaustive, but show that the selection is broad and varied. Between the conifers and broad-leaved types, there is a perfect choice for every location and purpose. Make your selections carefully based on the intended use, adaptability to your climate zone (including temperature and rainfall), shape and eventual size of the plant. Choose your favorites from among the species listed, and visit your local nursery for specific cultivars that are best adapted for your area. Click here for a list of broad-leaved evergreen shrubs. Click here for a list of evergreen ground covers. Click here for a list of evergreen vines.